Once a sleepy outpost of Sydney, the Central Coast is boasting new gastronomical gems to be discovered. New upmarket restaurants and trendy cafes have sprung up to offer the freshest ingredients and locally sourced produce on their menus. Where to stop on a road trip and deciding where to eat is often the hardest part. So whether you are looking to escape the city or wanting a beautiful location to enjoy a meal – Central Coast is a mere one and a half hours North of Sydney and is the new foodie paradise waiting to be discovered. 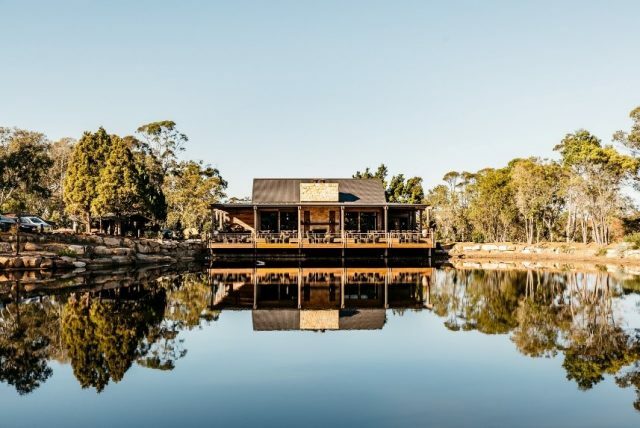 An hour out of Sydney, minutes off the motorway and in the middle of the bush, this new stunning restaurant is the place to escape! 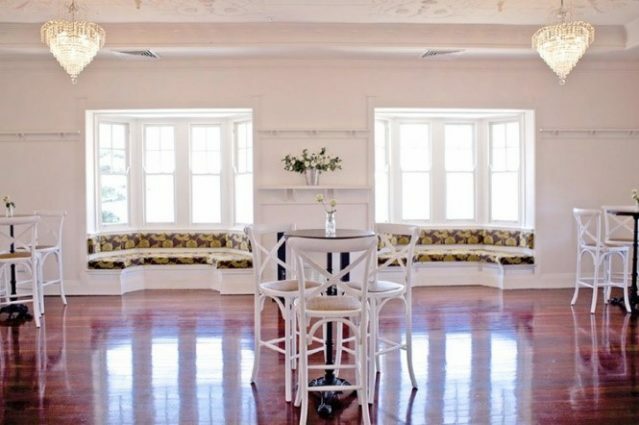 This serene setting is located in Mount White on 28 acres of bushland. 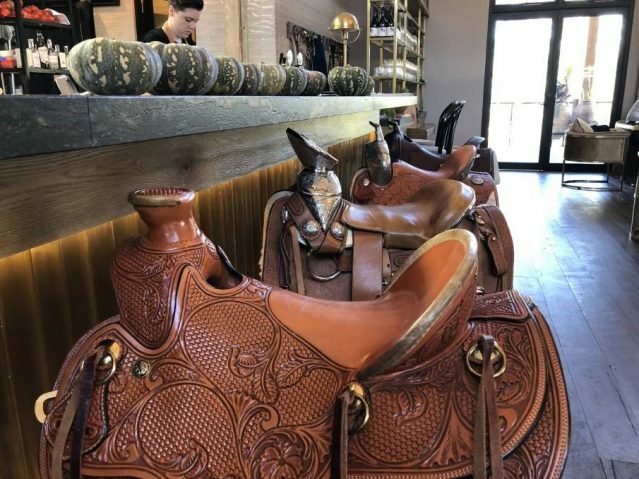 When you arrive at Saddles you will be struck by its quality craftsmanship and elegance. From the outset it replicates an Australian homestead setting, particularly with the rambling deck that sits over the glassy dam. The linen curtains are set back into an Ironbark beam and held back by brass to match the brass pendant lights that hang from the eight metre high ceiling. The bar is edged in brass with an upper granite surface with the wonderful artistry of bespoke saddle bar stools, from which the restaurant gets its name. The Ironbark panelling and bannisters have been acid washed to give the appearance of being aged and distressed. The property includes a dining area overlooking a waterfall feature, a sandstone fireplace and a piano bar. The detail goes on and all adds to the atmospheric ambience when you are enjoying your meal. Owned by John Singleton, known for reinventing Icebergs at Bondi, has aimed to offer an unpretentious meal that offers a high standard of quality. The husband and wife team, Cameron and Hayley Cansdell of Bombini at Avoca and Fish Dining at Gosford waterfront, are the chef/host team in charge of delivering service and quality. They have designed seasonally focused à la carte and bakehouse menus, with a simple and ethical approach to food. The menu includes a selection of house made charcuterie, fresh flaky pastry tarts, kitchen garden salads, Roast Little Hill chicken, grilled rainbow trout with lemon and chive butter. Daily desserts include traditional pies tarts and cream rolls. The bakery offers homemade sourdough, breads, pastries cakes and sweet tarts as well as Australian classics including meat pies and sausage rolls! They have an onsite garden with heirloom fruit and vegetables and source their organic food locally. 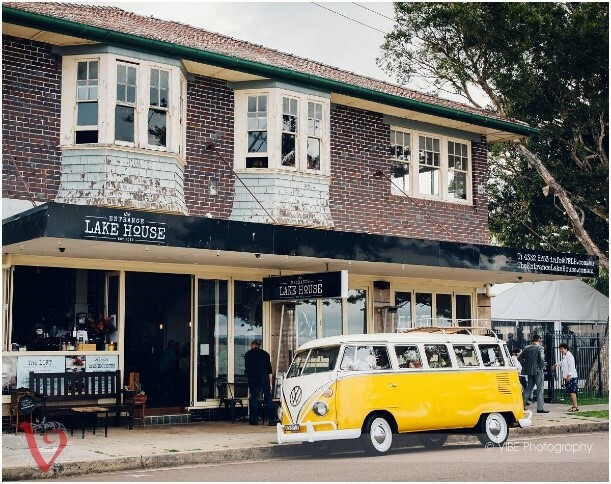 Leading the Central Coast revival of innovative Australian Cuisine, this pretty coffee is only metres away from the sand and overlooking the rolling waves of Broken Bay. Under new ownership the restaurant continues to live up to its reputation and this year was awarded the coveted one chef’s hat. 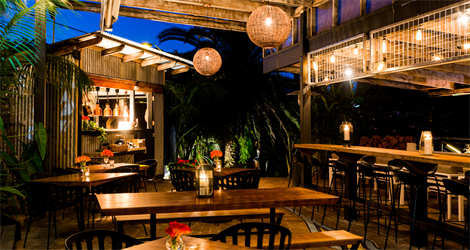 This ‘must have’ Central Coast dining experience is set in a beach house looking over the bay. Here you can experience eating in the calm ambience of whitewashed floorboards, sash windows in this chic shack setting. Rediscover old classics from the menu and constantly evolving dishes which use seasonal produce. Farms in Mangrove Mountain and Somersby supply the restaurant with fresh produce and along with up to date culinary trends an outstanding contemporary Australian cuisine menu. Exceptional service combined with an extensive wine list ensures Pearls on the Beach adds up to be an experience which makes you feel a million miles away from the city. This luxurious restaurant is a stone’s throw away from the walking trails of Bouddi National Park and the golden sands of Killcare’s Putty Beach on the Central Coast. Think blue and white striped awnings, neat and tidy gardens with boutique accommodation and spa facilities. 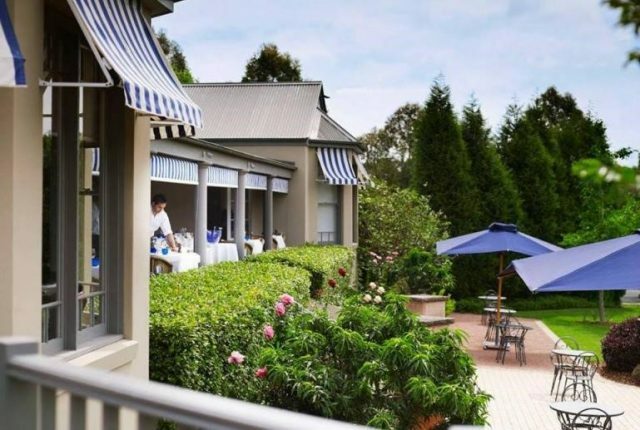 This award winning restaurant and hotel is set in the leafy town of Killcare Heights. The English garden inspired grounds and cottage embrace what nature has to offer. With a team of passionate hospitality professionals you can discover the delights from their acclaimed bar, a cleverly sourced Antipasto to a Five Course appreciation reflecting the seasonal menu as well as a la carte. Resting on a hillside in a leafy setting this fabulous venue is making its mark for its modern Italian cuisine. Catching the cool breezes through the louvre windows you will find sunfilled corners and shady nooks as well as daybeds. Striking the right balance between stylish and rustic, the décor is clean and sleek, , verandas, hardwood floors, chic modern furnishings as well as a green lawn outlook on this 2.5 acre estate. Cameron and Hayley Cansdell are Chef and restaurant manager respectively, have fulfilled a dream of their own by recently opening Bombini. They offer a modern Italian cuisine with light Mediterranean dishes with an emphasis on fresh produce selected from Australia and Italy. With a focus on sustainability and an emphasis on fresh produce selected locally and internationally they also use their own grown vegetable from the 2.5 acre estate as well as their chicken farm. There is an upstairs bar area with a huge covered and outdoor space, serving up delicious bar food. The restaurant features a three course a la carte menu with antipasto, cocktails and a wide diversity of wines. The restaurant has a lovely outdoor patio from which to view the country surrounds and the sunshine! Lakehouse at The Entrance is the perfect food location to find friendly staff and glorious views over the water. Previously a guest house then a Thai restaurant, Lakehouse has now been redesigned and restored to its original former glory. Inside there is a blend of heritage features, including original wooden floorboards, high moulded ceilings, leadlight windows and bespoke modern fittings. In the upper room you can enjoy high tea in comfortable surroundings with a stunning view over the water. Think all things sweet and savoury on a tiered platter whilst enjoying loose leaf organic tea or freshly made espresso coffee. Diners in the main downstairs room are served fresh and absolutely delicious seasonal Australian fare as well as prosecco on tap and carefully chosen beers. The wine list is carefully selected and advice is always on hand for a recommendation to go with your meal. A pretty marque and garden space also offers visitors a delightful space to enjoy cocktails or nibbles. The Lakehouse is always offering something new and exciting with a regularly changing dinner menu. Fish Dining is an elegant, modern seafood restaurant opened a year ago on the sparkling Gosford waterfront at Point Frederick. This is the second coastal establishment owned by Cameron and Hayley Cansdell who also own Bombini at Avoca beach and Saddles in the bush at Mount White. 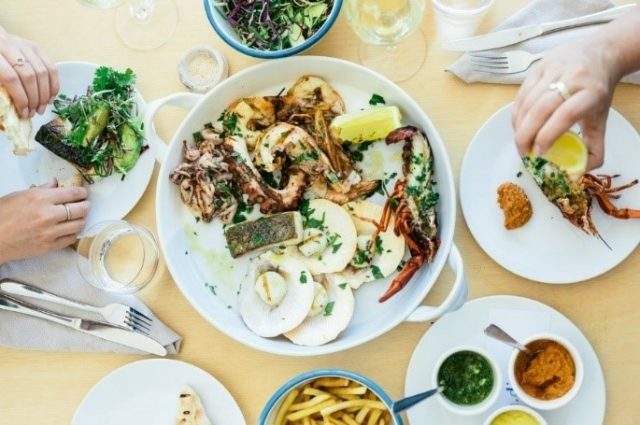 They are continuing to make their mark on the Central Coast dining scene and are committed to offering some of the finest seafood Australia has to offer. This restaurant’s emphasis is to serve more modern Australian seafood, rather than Italian style dishes by which Bombini is known. They are continuing to uphold their sustainability emphasis whilst showcasing diverse flavours and combinations that are light, fresh and fun inspired by ideas from around the world. 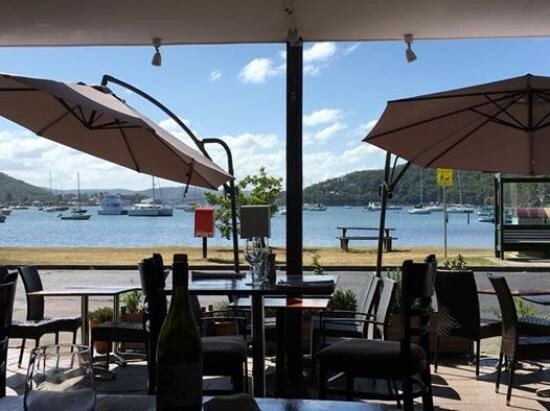 The light filled restaurant overlooking Gosford waterfront has seating for about sixty people whilst the downstairs bar has an alfresco dining area perfect for lunches. Fish dining offers a three course a la carte menu or a variety of smaller menu items for a quick meal or tapas style snacks to share. A handpicked selection of fish from reputable fish mongers is served either grilled with perfect dressings or included in a beautifully presented dish. Approximately a 90 minute drive from Sydney, Terrigal has recently been a favourite destination for Sydney siders and Central Coast residents. The beachside town has lots of attractions that appeal to many tastes. After three years, one of Central Coast’s favourite bar and dining restaurants has had a face lift. The fresh new look has been created by local interior designer Kazzi.D and brings a bright summery vibe. The centre feature a new look open kitchen with a two tonne pizza oven that is insulated with volcanic rock, a wood fired rotary oven and a new bread, pasta and gelato making machine. Diners can drink and dine downstairs at the bar and restaurant or indulge themselves in the new rooftop alfresco space upstairs and menu. The menu offers, starters, salads, handmade pasta using Italian flour, antipasto and homemade gelato. For Gluten free diners, zucchini can be substituted for any pasta and pizzas can be ordered with GF bases. Every ingredient on the menu has been hand selected to give the best quality and flavours. The bar features a refreshing selection of light and breezy Italian inspired cocktails, with a good range of Italian amaros and vermouths. With a greater emphasis on modern Italian food and top quality service it is now a brighter place to linger over a long lunch or sip cocktails in the sun in a world class location. 8. Seasalt – There is Magic About Restaurants in Hotels! 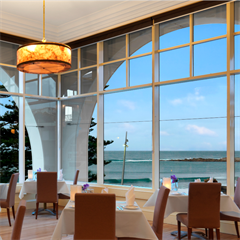 The large glass windows in Seasalt restaurant offer one of the best views on the Coast. Situated in the grand ambiance of the Crowne Plaza Hotel, the restaurant can be enjoyed by locals and tourists, as well as the hotel guests. The restaurant is contemporary, yet stylish with its natural tones, columns and white table clothes. A thoughtfully prepared seasonal menu, created from the freshest ingredients gives a whole new meaning to dining in this elegant setting. Produce is sourced locally when possible and includes freshly picked herbs from the restaurant’s rooftop garden. The menu is diverse and known for its buffet breakfasts and high teas. There is an extensive wine list featuring Hunter Valley wines, tap and craft beers, champagnes and cocktails. The staff are kitted out in crisp white shirts and black aprons adding to the professional and grand atmosphere of the restaurant. Overlooking the Terrigal Beach you will see and hear the waves rolling in. If dining at sunset, seeing the open sky and the pink hues over the Tasman Sea, is an experience not to be missed. Best to have a reservation though, as the restaurant is very popular and if you can secure an Oceanview table you will have a one of the most memorable degustation! Serenely located on the water front of Hardy’s Bay the restaurant is named after the iconic Yum Yum tree nearby. Appealing with its water views, Yum Yum Dining has been a favourite of locals and visitors alike. Clinton Brown and Hayley took over the restaurant in 2017. They are committed to sourcing the freshest and very best produce available. Clinton has had an impressive career, working with food and now showcases an awe-inspiring la carte menu. He puts an emphasis on premium sourced seafood, seasonality and subtle flavours. The dishes are based in three areas of the Past, the Present and the Future these concepts means there is an extensive choice to suit all tastes. The bar carries a well thought out range of wines, beers, spirits and liqueurs to suit all tastes. The owners believe that fine food need not be too expensive and along with fine Australian wines this pretty location is a place to relax and eat! Homemade traditional Italian food made with love, is the promise of this popular restaurant. Offering a rich selection of rustic Italian style dishes, Osteria A’ Mano offers an authentic tribute to Italy in the heart of Wyong. Here the owners strive to create a little corner of Italy, focusing on the best ingredients the market has to offer and cooking with sustainably sourced produce when possible. 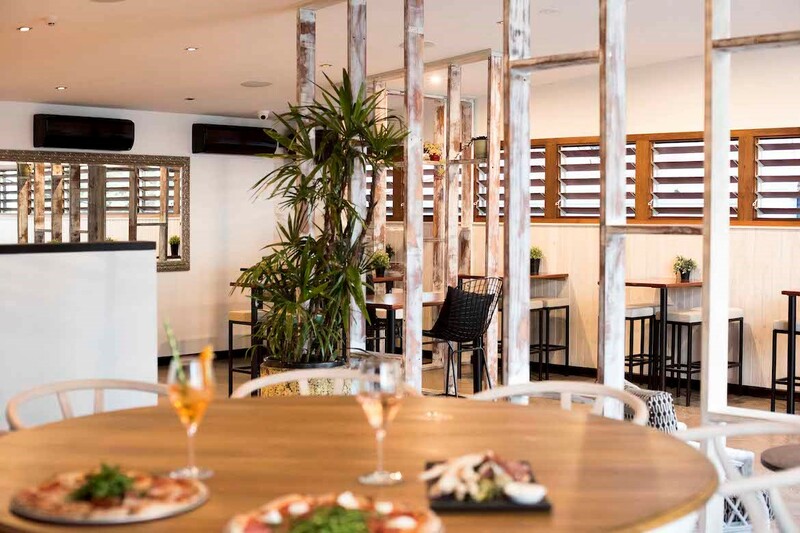 Their menu showcases traditional Italian dishes with all their bread, pasta, mains and deserts being homemade on the premise .Osteria A’ Mano offers a wine list which features small producers from both Italy and Australia who like to make the wines in a past down traditional way. There is a good selection of beers and to finish off the meal they offer grappa, limoncello or locally sourced organic coffee. 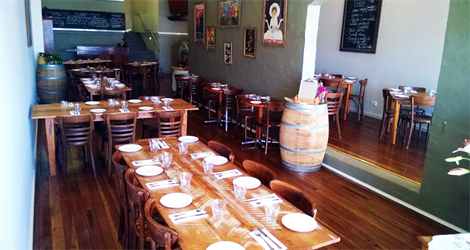 The restaurant is situated in a heritage listed building and is one of the few remaining in Wyong which has not significantly changed. With a marked effort to preserve the interior the shop front, floorboards, and tiles are still original. Osterio A’ Mano is a place where you can sit back and relax with a glass of Sangiovese or Pinot Gris in hand, “ A’ Mano”, knowing you taste buds will be delighted!